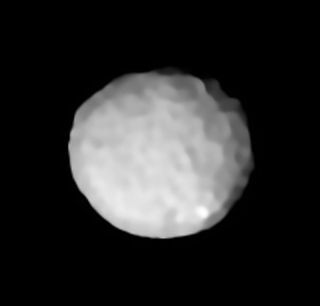 An image of the asteroid Pallas captured by the European Southern Observatory's Very Large Telescope. THE WOODLANDS, Texas — NASA is considering funding a mission that would send a satellite the size of a mini-fridge to the asteroid belt to examine an unexplored world, a massive asteroid scientists call Pallas. The decision will be announced in mid-April. If the mission, dubbed Athena for the Greek goddess the asteroid is named for, is approved, it would follow in the path of NASA's Dawn mission. That spacecraft explored two other giant objects in the asteroid belt, Vesta and Ceres, before its mission ended this fall. "Pallas is really the only other object in the main asteroid belt that's like Vesta and Ceres … not just an asteroid, but a protoplanet, a real world," Joseph O'Rourke, a planetary scientist at Arizona State University and principal investigator on the Athena mission proposal, told Space.com at the Lunar and Planetary Science Conference being held here this week. "I see this as a way to go do a lot of the same science that Dawn did, but at a dramatically cheaper price, and Pallas is the sort of place that might be worth sending a much bigger mission to someday." If selected, the mission would launch in August 2022, riding piggyback with NASA's Psyche mission that is bound for an asteroid made nearly entirely of metal. "We would race Psyche to Mars, use Mars as a gravity assist, and then catch Pallas," O'Rourke said. The Pallas flyby would come about a year after the launch. During the maneuver, Athena would take an extremely precise measurement of just how massive Pallas is and snap a bunch of images of the asteroid, which scientists could then use to piece together how water and impacts may be shaping its surface. "There's hints on the ground that it might have bright spots like Ceres," O'Rourke said, referring to features Dawn scientists believe may represent salty patches on that asteroid's surface. "So it could potentially be a place with a lot of interesting chemistry going on." With a price tag about a tenth the size of the $467 million Dawn mission, and a single flyby instead of long-term visits, Athena likely won't produce as comprehensive a package of science results as the Dawn mission has. But it should be enough to begin to understand this little-known world, according to O'Rourke. "This mission is going to pluck a lot of the low-hanging fruits scientifically," he said. "Hopefully, it will showcase the fact that we're beginning a new era of planetary exploration," in which cheap probes can precede flagship missions. The Athena team would also post all its images soon after downloading them from the spacecraft. "In fact, one of my biggest worries about the mission is that the mission team will get scooped on the science," O'Rourke said. "Everyone will be able to make our discoveries right along with us, so we'd better be ready to bang out some papers." NASA's decision, whether it chooses Athena or not, will come just a few months after the first tiny satellites to venture beyond Earth's orbit proved just how valuable small spacecraft can be to planetary scientists. Two cubesats the size of bread boxes hitchhiked with NASA's Mars InSight lander as the Mars Cube One (MarCO) mission. The little satellites captured stunning images of the Red Planet and in November, they acted as communications relays, saving scientists from hours of agony about whether the main spacecraft had touched down safely. Athena would be larger — the size of a miniature refrigerator and about 400 lbs. (180 kilograms) — but would still represent a new mindset for planetary science, one that relies on dramatically less complicated spacecraft than traditional missions. "I think the asteroid belt is a really great target for smallsats because there are so many targets that are interesting, we're not going to send these half-billion-dollar-plus missions to every single one," O'Rourke said. "So we have to get good at building these small flight systems that are versatile and can be used to explore."